I linked up two this week. Pinterexia Nervosa: A guide to the disease, it's symptoms, and treatments. Do you or a loved one have a Pinterest Disorder? Perform a self-check! The Date, The City, The Cure: Birmingham blew me away. 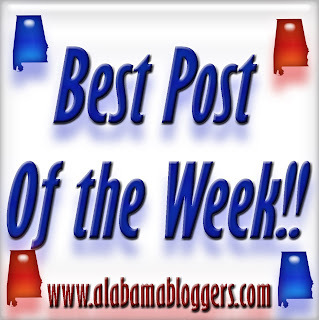 I had a hard time deciding which post to pick for this week because I really liked Tuesday's post also. However, I finally settled on one that would be possibly informative rather than random. Organizing a Rocket City Bloggers Meet & Greet with the Huntsville Madison County Convention & Visitors Bureau. 10. Y'all Connect - I'm proud to announce the release of my first book. Get a free copy and let me know what you think. 11. Project Bulk - I didn't think I'd continue to bulk up. I was wrong, fortunately. blogged about a night out on the town in Birmingham! I'm offering up this post on why I think the "crowdsourcing" rage will disappear soon enough.